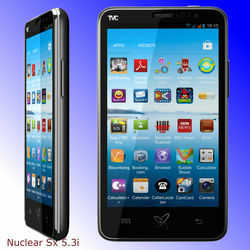 Nuclear SX 5.3i - TVC Skyshop - Buy world-class innovative products at affordable prices offering full value for money. 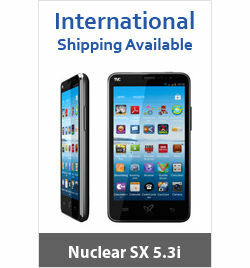 Nuclear SX is a new age phone and more intelligent than other smart phones. 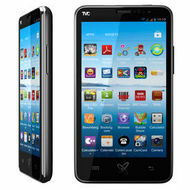 This is the smartest phone around with 5.3-inch multi- touch capacitive screen, 8MP camera, and latest Android operating system. This feature-rich phone has got cool and stylish looks. Dual SIM and dual standby facility makes this sleek device even more efficient. Nuclear SX replaces 20 high-end gadgets as it comes loaded with 250 applications and features. From playing HD games in a large screen to listening to world music, Nuclear SX is your ticket to wholesome entertainment. Professionals would fall for this office-friendly phone having in-built office applications for smoother operations even when they are on the move. 1GHZ Dual-Core high-speed processor enables Nuclear SX to go on and on without slowing down its functionality. Accessories worth Rs 3,000 including 2 sets of phone cover, 8GB Memory Card come free with Nuclear SX 5.3i the smartest phone ever. Fantastic more than 1 week﻿ ago buy from TVC awsom phone! "TVC Skyshop has been an efficient provider.Highly recommended shopping from TVC Skyshop"